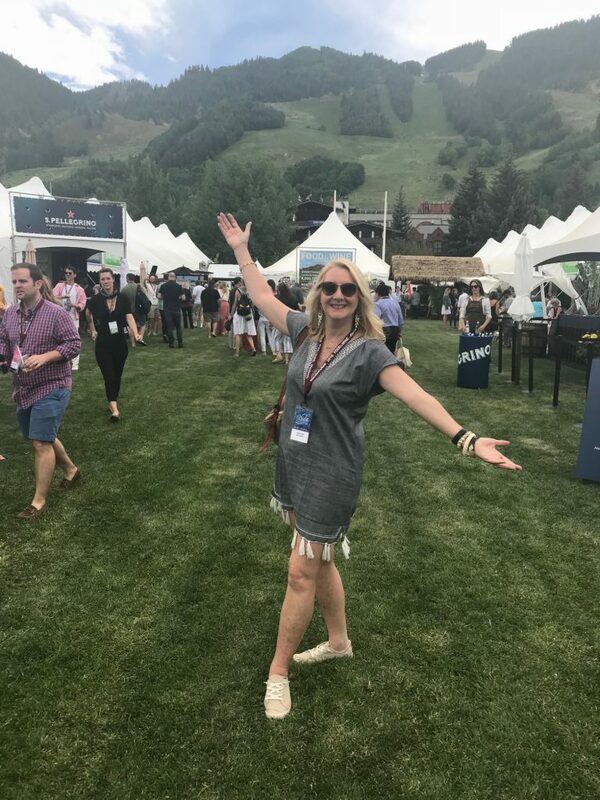 As if Aspen isn’t high enough, when over 5 thousand food and wine lovers arrive the Rocky Mountain town lights up with enthusiasm for tasting the creations of chefs, wine makers, wine experts and cookbook authors assembled each year for the Food & Wine Classic in Aspen. 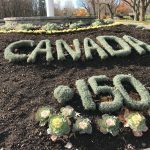 At 8000 feet the altitude makes you light headed enough, but add over ten thousand bottles of wine and hundreds of chefs dishing up the best and you’ve got a party not to me missed. 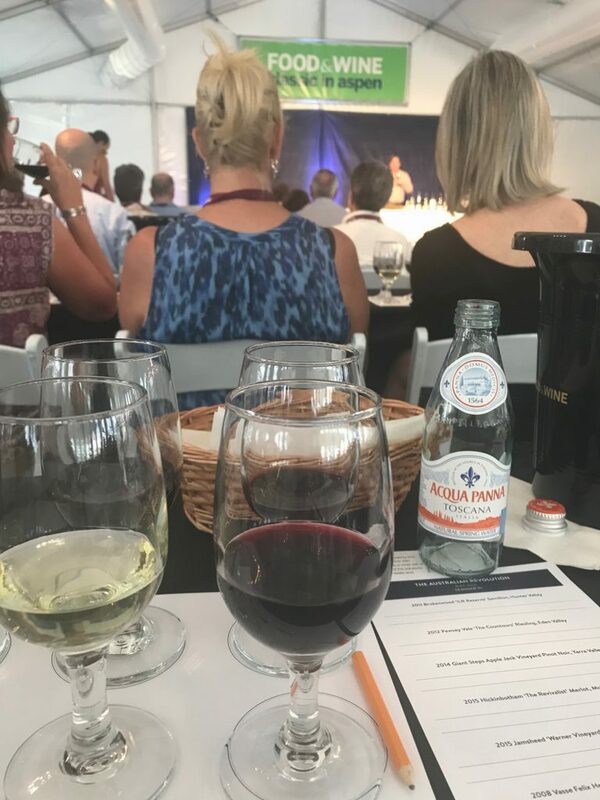 Wine tastings led by experts such as Ray Isle, Wine and Spirits Editor for Food & Wine Magazine teach the art of understanding wine making and wine enjoying! 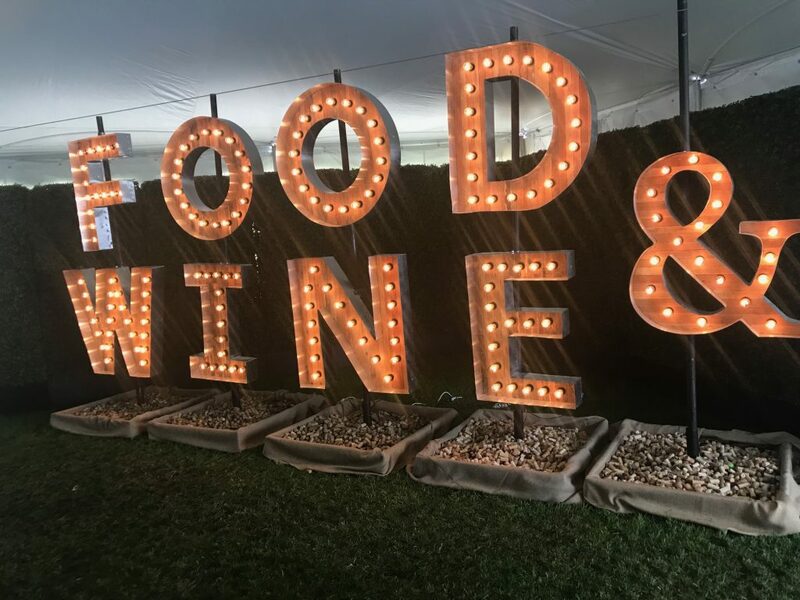 Make your plans now to attend the 2019 Food & Wine Classic in Aspen next June. 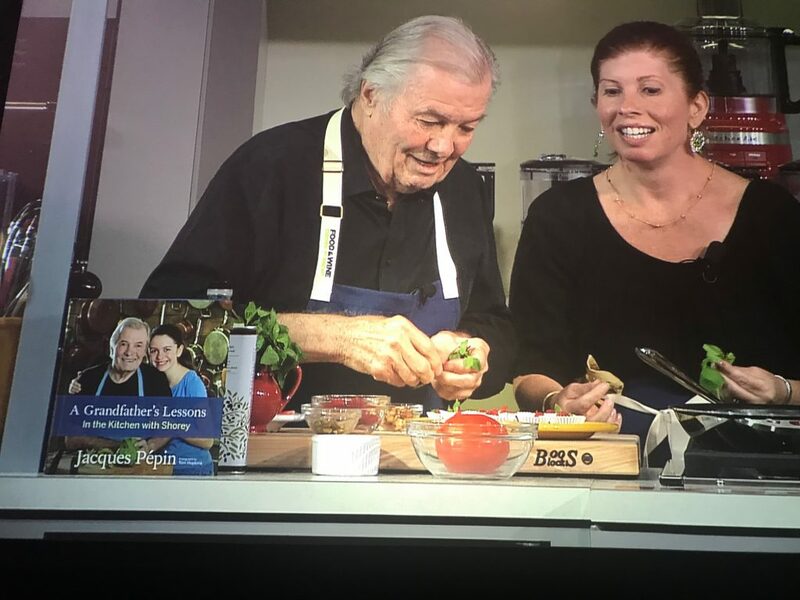 But, for now, sit back and enjoy a few highlights including two recipes from the best loved chef guru on the program, Jacques Pepin. Oh and if you love Jacques, visit his site to support the Jacques Pepin Foundation and yes, you can buy his original art. Jacques and his daughter Claudine pack the house when they present cooking classes for foodie fans and I was one of them with a front row seat as they cooked, performed, laughed and learned right along with the audience. 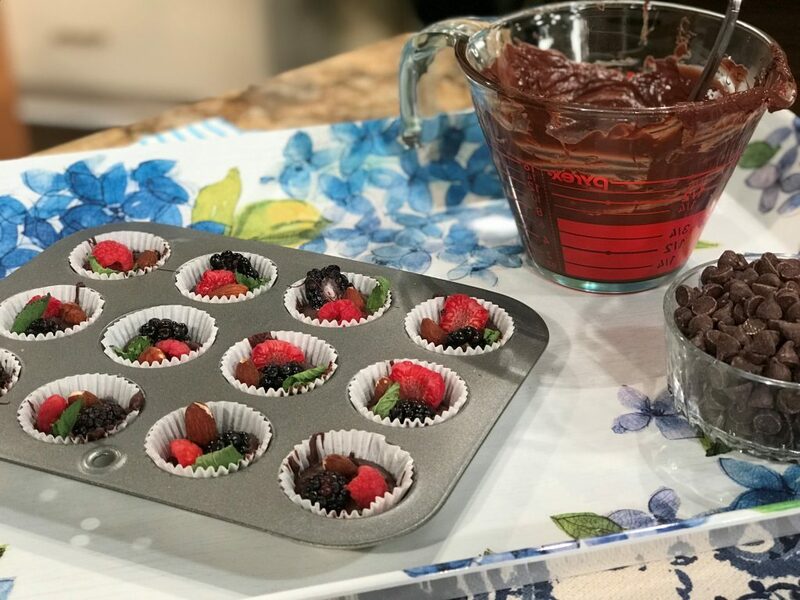 Christine and I made these Chocolate Fruit and Nut Treats LIVE on Atlanta & Company. Tres bien Jacques! 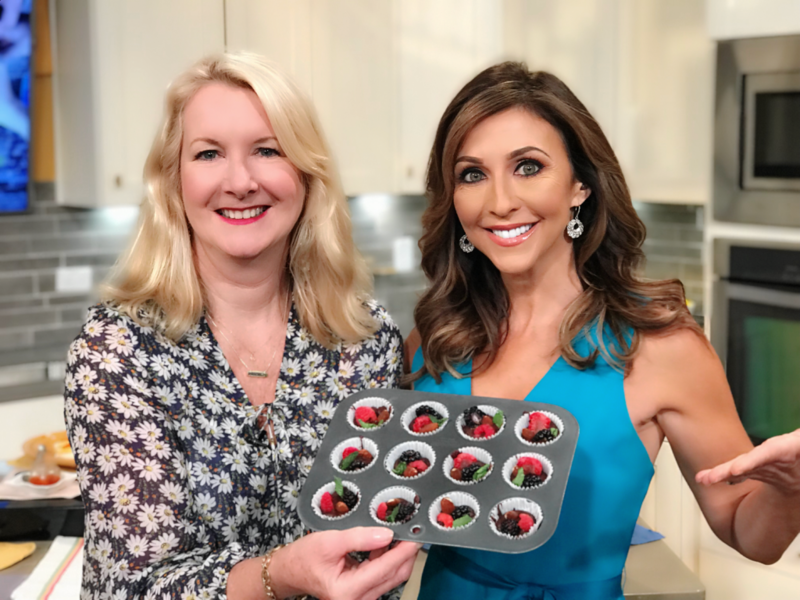 I was so inspired by the cooking demo that I created a TV segment to share two of the recipes on NBC Atlanta & Company with host and my friend Christine Pullara. Click HERE to watch the recipes come together, easy enough to create in less than 6 minutes on a TV show!!! Deviled eggs are festive, classic or new, fashionable and delicious. Everybody loves them and I wanted to make them with Shorey. The most important lesson in this recipe is proper cooking of the eggs: from pricking the round end of the shells to relieve pressure and help prevent the eggs from cracking to cooling the cooked eggs in ice water to avoid the formation of a green tinge around the yolks and the smell of sulfur. The stuffing mixture, made in seconds in a food processor, combines the egg yolks with cream cheese and a touch of mayonnaise and mustard. 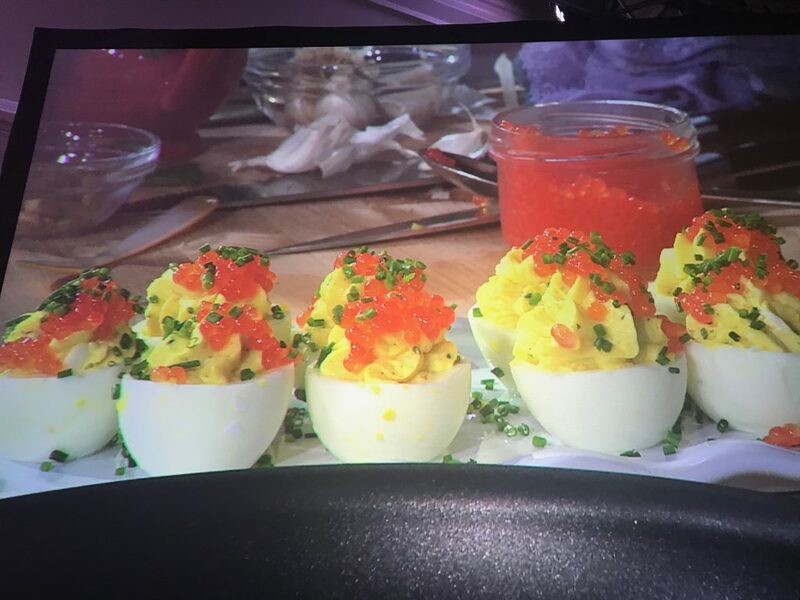 I garnish the eggs with salmon caviar, but you can use trout or sturgeon caviar instead. Or you could place a caper or an olive on top of each one, or a small piece of smoked salmon. Use your refrigerator and your ideas. The deviled eggs can be made a few hours ahead. Bring 6 cups of water to a boil in a deep saucepan. Meanwhile, prick the rounded end of each egg with a pushpin. Lower the eggs into the boiling water, and when the water comes back to a boil, reduce the heat so the water stays at a gentle boil. Cook the eggs for a total of 10 minutes. Pour out the water and shake the pan to crack the eggshells all over. (This will help in the peeling of the shells.) Immediately cover the eggs with cold water and ice, and let cool for at least 15 minutes. When the eggs are cold, peel them under cool running water. Then cut a small sliver of the white from both ends of each egg, so the stuffed half eggs can stand upright, and cut the eggs crosswise in half. Carefully remove the yolks and place them in a food processor, along with the egg white trimmings, cream cheese, mayonnaise, mustard, salt, pepper and 1 tablespoon of the chives. Process for a few seconds to combine the ingredients well. The egg white halves can be stuffed using a spoon, but it is easier to do this with a pastry bag fitted with a star tip. Spoon the yolk mixture into the pastry bag and fill each egg white half with a rosette of the mixture. 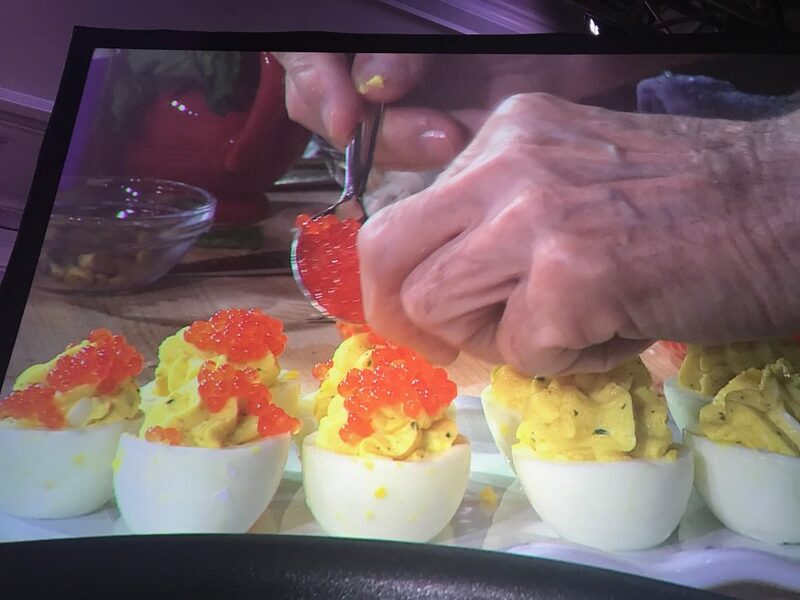 Arrange the deviled eggs on a plate, and top each with about 1⁄4 teaspoon of the salmon caviar. Sprinkle the remaining chives on top. Shorey and I have been making chocolate desserts together since she was 4 years old. 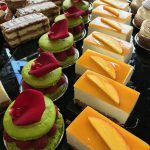 She likes chocolate in any form, from chocolate mousse to chocolate cookies, cakes or truffles. These treats are great to make for the holidays, birthdays and other special occasions. The recipe can be varied; for example, although we use dark chocolate, you could try it with white or milk chocolate. Or, instead of pistachios, almonds and hazelnuts, you might want walnuts, pecans, macadamias and/or peanuts. Rather than strawberries and raspberries, you can use blueberries or blackberries, as well as dried apricots, cranberries or cherries. We make our treats in very small paper baking cups with a 21⁄2-tablespoon capacity; the bottom is 1 inch in diameter and the top is 2 inches. Of course, they can be made in larger paper or aluminum cups, but I find the small ones are quite enough for desserts, snacks or treats. Melting the chocolate in the microwave oven is foolproof and easy. Break the chocolate into 1⁄2-inch pieces and microwave it for one minute, then wait a few minutes before processing it further. Microwaving it for more than a minute to start will scorch the chocolate. Put the chocolate in a microwavable bowl, place it in the microwave, and microwave for 1 minute. Let rest for 30 seconds, then microwave for another minute. The chocolate should be melted by then, but if it isn’t, process it in 30-second increments, stirring after each increment, until it is totally melted and smooth. Arrange 12 tiny frilled paper cups (see headnote) on a plate and pour about a good tablespoon of the chocolate into each cup. While the chocolate is still melted, arrange the berries, nuts, and mint on top of it in whatever manner you prefer—berries only or nuts only in some of the cups—and push down on them lightly to embed them in the chocolate. Refrigerate the cups for 45 minutes to 1 hour to set. Peel the paper cups off the hardened chocolate and arrange the treats on a dessert plate. Keep refrigerated until serving time.